The Walnut family - Juglandaceae - is made up of approximately 20 species of trees that are native to Central, Southern and Eastern parts of the United States, Central America South through the Andes, and from Southeastern Europe through Asia and Japan. There are only six species that are native to the United States, two of which have very wide growth ranges thorughout the Eastern most parts of the country. Walnuts are closesly related to Hickories with the only significant difference being the chamber pith that the Walnuts have and the Hickories do not. The Walnut is a large tree that grows in a rounded shape at the crown. The leaves can grown up to 24 inches long with 9-21 toothed leaflets making up a single leaf. The leaflets growing at the base of the leaves are larger in size then those growing towards the tips. The catkins grow both male and female on the same tree and are green in color. The wood of the Walnut is very finely grained, hard, and excepts a very high polish. Once seasoned, Walnut wood is very stable and resists warping and cracking. It is highly sought after for the crafting of fine wood gun stocks and high end furniture. The fruit is round and warty in appearance and encase the hard wrinkled shell edible nuts. Walnuts are a high density source of nutrients, particularly protiens and essential fatty acids. Walnuts like other tree nuts must be processed and stored properly to remain safe for consumption. Poor storage makes Walnuts susceptible to insect anf fungal mold infestations. The Paulownia family consists of approximately 17 varieties of trees native to North American, China, Laos, Vietnam, Japan and Korea. Common names for these trees are the Paulownia, Princess Tree, Royal Paulownia, or Empress Tree. The are prized mostly for their showy clusters of violet flowers in the early spring that grow from panicles that are 3-11 inches long. The flowers themselves resemble a foxglove flower and many say the Paulownia is part of the Foxglove family while others catagorize it as a member of the similarly leaved Catalpa tree. It has very recognizable large heart shaped leaves that grow on average from 6-18 inches across. 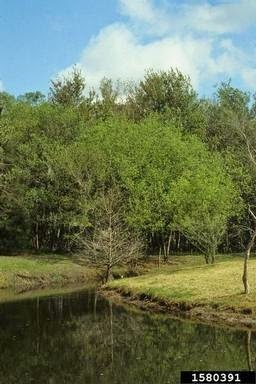 This is a fast growing family of trees and when young, can grow up to 20 feet in a single season. This rapid growth habit makes it sometimes weak and succeptable to limb breakage or loss as it matures. Taking advantage of this rapid growth rate, some Paulownia plantations are able to harvest lumber in as little as five years. In China the Paulownia is both a popular roadside and ornamental tree. It's wood is also used to make sound boards for many string instruments throughout Asia. The lumber is also used in many agroforesty settings as the wood is light but strong. In Japan where it is called the Princess Tree, it was customary to plant a tree to honor the birth of a baby girl and then cut the tree at the time of her marriage to craft a piece of furniture for her new home (often a dresser or chest). Because of the tight graining this type of wood it is also used to make guitar bodies, skis, chests, boxes, and traditional wooden clogs. The "Dragon's Claw" or "Corkscrew" Willow - Salix matsudana - is a cultivar of the Chinese (Babylon) Willow. This cultivar grows very fast from cuttings made from the youngest (and often most curly) shoots. It is considered medium to large in size and is a deciduous tree that grows in a primarily upright fashion. Chinese Willow's have a relatively short lifespan, estimated between 40-75 years in the wild. The Chinese Willow is a Native of Northeastern China. It has been planted heavily as an ornamental in the United States, Europe and Australia, so is seen often outisde of it's native area. The leaves of this variety come out early in the Spring and often hold on well into December. Even in Winter when the tree is bare the interest of the curls and curves in the branches remain, making it a beautiful year round addition to any landscape. The leaves are green in color and when flattened look similar to the more common types of Willow (Weeping, Babylon and Coastal). 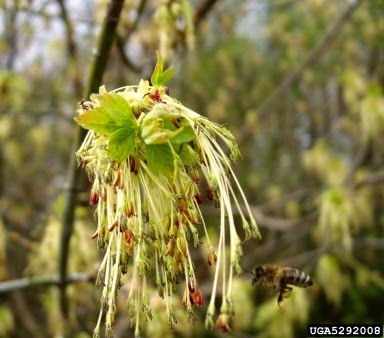 The female and male flowers appear as Catkins and are always on different trees. The branches are often used in floral arrangements or even as bonsai because of their unique curling habits. The Corkscrew Willow is available at most major nursery's and makes a lovely addition to any landscape. It may also be sold as a Dragon's Claw Willow or Curly Willow. The Idaho Locust -(Robinia × ambigua)- is a hybrid believed to be a cross between a Black Locust and either a Downy Locust or a Bristly Locust. This tree is a member of the Fabacae-Legume family. The Idaho Locust is a very tolerant tree, it has a high resistance to salt, drought, and alkalinity. Contrary to it's name it is not actually native to Idaho, but planted widely as an ornamental in the semiarid range from Idaho to New Mexico. The foliage and flowers are very attractive and are considered the main reason for it's popularity in landscape plantings. The Twigs and Buds are similar to a Black Locust being moderately stout with short stiff spines growing in pairs at the base of the leaves.The leaves are also similar to the Black Locust being dark green in summer and a yellowish green in the fall. The leaves grow 8-14 inches long. They have no terminal buds and the lateral buds are hidden under cracks in the bark near leaf scars. The flowers are beautiful ranging in color from a Rose-pink to a lavender Purple. The flowers are very fragrant and occur in late Spring, hanging in 6-8 inch groupings or racemes. The Box Elder -Acer negundo- is a small often bushy deciduous tree. Often times called an Ashleaf Maple since it has no similarities to the Box Tree or The Elderberry. It has a very vast growth range Growing as far North as New York, Michigan, Saskatchewan, and Alberta Canada- As far South as Texas, Mexico and Guatemala-Crossing the Rocky Mountains in Montana and going as far West as New Mexico, Arizona and small portions of California. The foliage color varies based on the local and can vary from a rich gloss green to a more yellow hue. The flowers are yellow in color and are slender hanging in bunches. 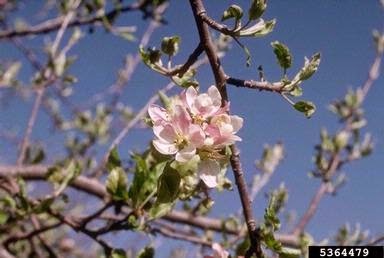 Male and female flowers appear on different trees. It is mainly found growing wild near streams, valleys and roadsides in most of the Eastern US. This tree is also a widely planted landscape tree, although it is sometimes considered a weedy tree because of it's bushy growth habits and attractiveness to insects. 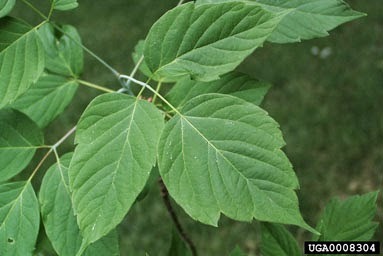 The leaves of the Box Elder are often injured by the sucking of young bright red Boxelder Bugs. 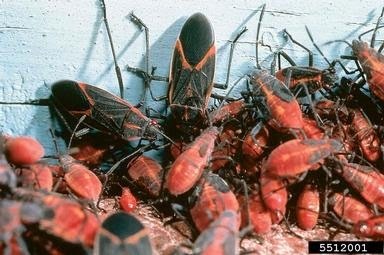 Mature Boxelder Bugs are a familiar sight, they are grayish black in color with three red lines on their back. 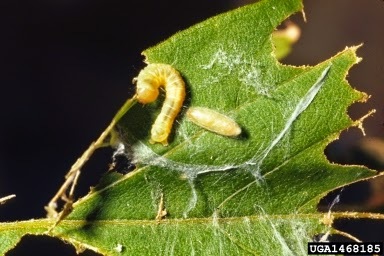 Some of the other insects these trees can be affected by the Elder Borer, the Boxelder Leaf Roller, the Boxelder Pouchgall Mite and the Elder Aphid. 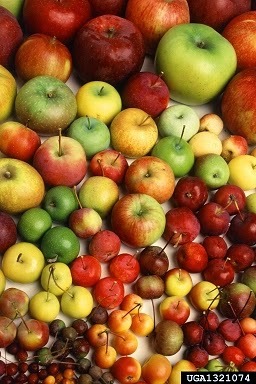 Apples are the pomaceous fruit of the Apple (Malus domestica) tree. 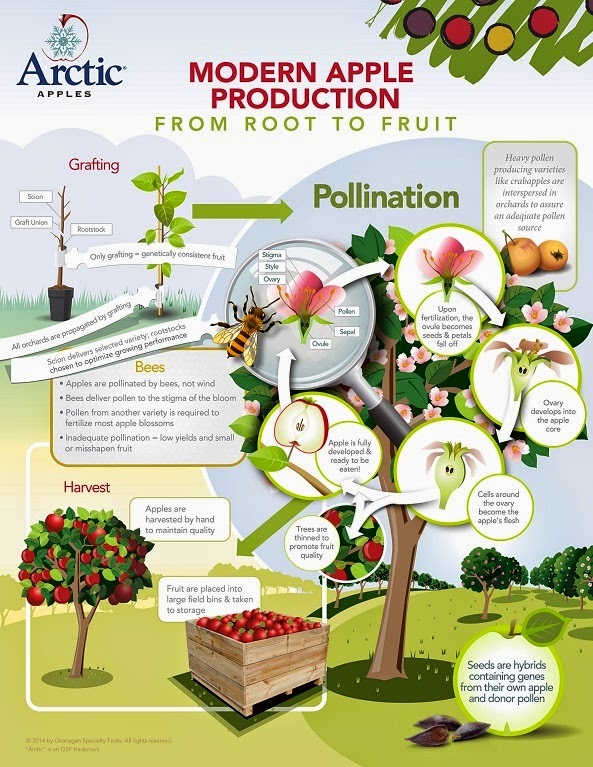 It is one of the most widely cultivated fruits and the most widely cultivated tree fruits in the world. 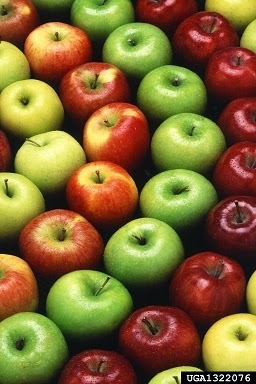 National Apple Month is the only generic Apple promotion recognized nationwide in the United States. 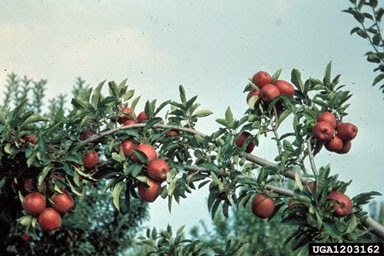 Originally founded in 1904 as National Apple Week, it was expanded in 1996 to a three-month promotional window from September through November, to encompass the prime Apple production period.